FC Halifax Town extended their unbeaten home run to nine games as they drew 0-0 with play-off chasers Ebbsfleet at The Shay. Ebbsfleet came into the match on the back of three straight wins, so a point against them is not to be sniffed at, especially when coupled with the victory over Solihull three days previously. It’s now six consecutive home clean sheets for The Shaymen, the latest achieved in a match where they produced some encouraging attacking play, but didn’t quite scale the heights of Saturday. Jamie Fullarton kept the same side that started in Saturday’s 2-0 win over Solihull, and why not. It didn’t take long for loanee Devante Rodney to show why Town fans are hoping this wasn’t the last they’ll see of him, as he brought a fine save from Nathan Ashmore inside the first 30 seconds. From the corner, he then headed wide from near the penalty spot after Nathan Clarke’s cut-back, moments after the centre-back’s shot was blocked. The movement, energy and work-rate of Rodney and Manny Duku up-front gave Town a constant outlet, and denied the Ebbsfleet defence a moment’s peace. The pair played with a confidence and expressiveness that made you wonder why they are currently unwanted at their parent clubs. If they don’t want them, Halifax will. Unless Cheltenham and Salford are reading this, in which case, they’re rubbish, you don’t need them back. The onus was on Duku, Rodney and Matty Kosylo to be Town’s creative force, and they showed some promising signs early on, with some probing attacking play, just missing the final pass. After Clarke headed over from a corner, Ebbsfleet’s first shot on target arrived midway through the first-half, but Sam Johnson reacted well to hold Michael Cheek’s close range effort after Lawrie Wilson’s right-wing cross. Duku and Kosylo linked-up well, with the latter bursting onto Duku’s lay-off with a lung-busting sprint before his close-range shot at the near post was turned behind by Ashmore, who closed the angle down well. Rodney then turned on the afterburners after spinning away from his marker near the halfway line, but after charging into the box at an angle, Ashmore held his low shot to the near post. Johnson then produced a terrific save to paw away Cheek’s header across goal from two yards out, as Ebbsfleet came into the game more towards half-time - barring a Duku shot deflected wide - squeezing in a rasping 30-yard drive just before the interval that Johnson saved comfortably. 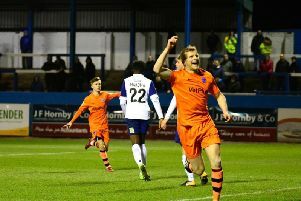 Halifax’s defence hadn’t been stretched like Ebbsfleet’s had at times though, and the nine-hour mark without conceding a home goal passed without too many nervy moments. Clarke and Matty Brown were so typically commanding and assured at the back, it’s hardly noteworthy any more. Duku had a chance to play in Kosylo or Rodney ahead of him shortly after the restart, but chose to go alone, and the chance fizzled out. Duku’s looping header from the edge of the box was then tipped over by Ashmore amid some good Town pressure. The hosts weren’t helped by injuries to Niall Maher and Michael Duckworth - the latter coming after his 30-yard shot was held by Ashmore - with both forced changes requiring reshuffles, and round pegs in not-as-round holes. Kosylo fired into the side-netting from a tight angle, but both teams were struggling to create much as the game went on, beset by poor decision-making and a lack of quality in the final third. Halifax: Johnson, Duckworth (King 67), Clarke, Brown, Skarz, Staunton, Kosylo, Berrett, Maher (Preston 53), Duku (Quigley 81), Rodney. Subs not used: Rowley, Gondoh. Ebbsfleet: Ashmore, King, Magri, Wilson, Bush, Adams (Drury 66), Rance, Weston (Graham 74), Payne, Cheek (Kedwell 80), Ugwu. Subs not used: Moncur, Whitely.